When I was in 8th grade I had a choice: to have my mom cut my hair (with a thick, same-length all-over style did that nothing for my game), or have my big brother who was the coolest kid in our town (the quarterback), cut my hair with dog clippers in the bathroom. My choice at the time (and still to this day) was to go with the “cool” one. You see, the foundation of attracting a male clientele is your degree of cool. This pertains to the environment, the culture, the people, wardrobe and products. At the core of every man there is a desire to be “cool,” and when you tap into it and deliver, you will be off to the races! Once you hook the gents with the cool factor, you have to know your stuff! (Education, education, education!) 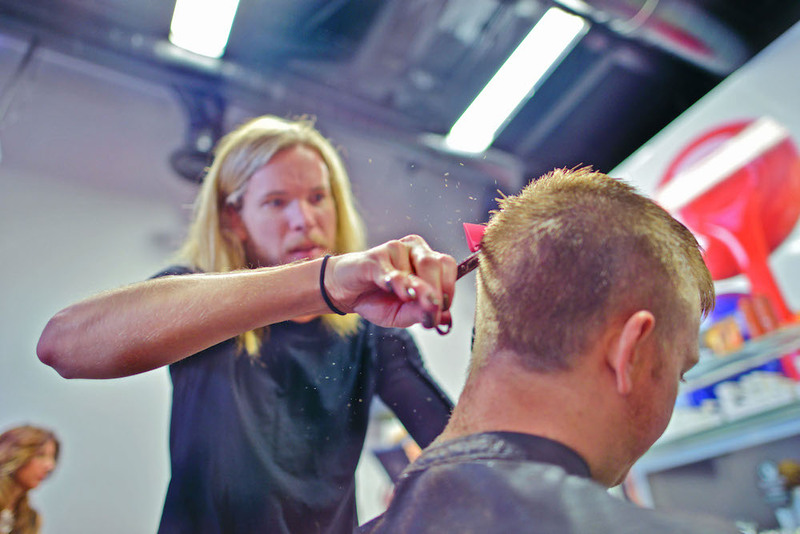 Paul Mitchell makes this so easy with various events, classes and material. Men want to know that you study your craft and that they are going to a place that is committed to curating the latest and greatest in all things. Guys want to feel known when they enter your environment. Take notes and put it in their file. Better yet, truly get to know them! If you know that they have water with two cucumbers every time they walk in, have it waiting for them when they arrive. Introduce them to others in the salon and pump them up. Guys want to feel important. One of my guests named Walid helped me open my first salon. He was also there with me when I lost my job, and believed in me through it all. Every time I introduce him to other people in the salon, I tell them this story; that if it wasn’t for him, our company wouldn’t exist! Are you interesting? We must be renaissance people as hairdressers. We must also read. Read anything! Read a book or magazines on cars, sports, watches, motorcycles, fashion and technology. Just know that men value meaningful conversation and enjoy them. Ask great questions and be ready to give your expert opinion on all of their grooming needs, including their skin! (I learned that from Diana Schmidtke, one of the greatest men’s groomers that our industry has ever known). The reason why a man goes quiet in the chair is simply because he is not engaged in interesting conversation. All men want to know they can rely on great work. You must have a system that can guarantee consistent results. You can accomplish this through technical training, culture and product knowledge. Men want to have longevity and will be your biggest promoter if you can deliver! These 5 C’s are not mere theory, they are my career, my story and my life.